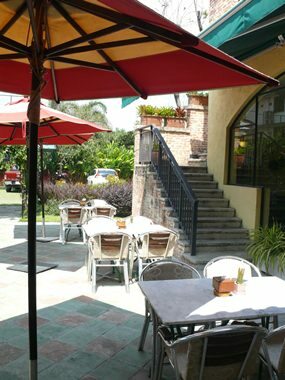 The name Pan Pan and Italian food has been well known in Pattaya since 1976. The first Pan Pan is down towards the bottom of Thappraya Road at the traffic lights, and there are two others, one in Central Festival and recently the other on Sukhumvit Road, after Mimosa and opposite Ocean Portofino. One would have expected the newer Sukhumvit Road venue at Km 157 to be Pan Pan 3, but no, it is called Pan Pan 2. Perhaps Italians count differently, or perhaps I have got it wrong, but no matter, it is easy to find. The restaurant is in a leafy garden setting, and does make one think of Italy. Go through the al fresco dining section outdoors and into the air-conditioned area with its own alcoves, a bar and a pizza oven and at the other side a refrigerated gelati cabinet. The menu is quite extensive, with many items presented photographically. An excellent concept that more restaurants should do. After all, the Russian visitors, by and large, cannot speak, let alone read English. The items are also described in Thai and English, as well as Russian. The staff are well dressed in black, plus two helpful young lady cashiers in pink. The restaurant area is quite large, with around four distinct sections. Photographs of Italian food adorn the walls, as well as some greenery on trellises. We sat back with a beer (Heineken B. 120) even though Prosecco was only B. 300 a glass. Red and white house wine is B. 220, or in a carafe at B. 600. We perused the menu, but while doing this we ordered a plate of pizza bread to nibble. Appetizers include Parma ham with the classical ham and melon served with pizza bread (B. 350 small or B. 550 large). Another popular starter is Bruschetta (garlic bread with tomato and basil, B. 100). Going further into the menu, there is minestrone soup (B. 150) and many pastas. Spaghetti with anchovies, garlic and parsley (B. 320) or Penne “Gianni” with cream, prawns and mushrooms (B. 360). Several salads are offered (B. 180-310) followed by the meat and fish choices. These include roast pork Italian style (B. 320) and various scaloppini’s with different sauces such as balsamic vinegar, tomato, lemon and Marsala. Fish fillets sautéed in butter with tomato sauce, olives and capers (B. 400). Pan Pan is renowned for its pizzas, and these range between B. 200-420. At the top end is Pizza Gorgonzola e Speck which has tomato, mozzarella, mushrooms and speck ham. There are also three vegetarian pizzas. We decided to share a starter which was a salmon salad (B. 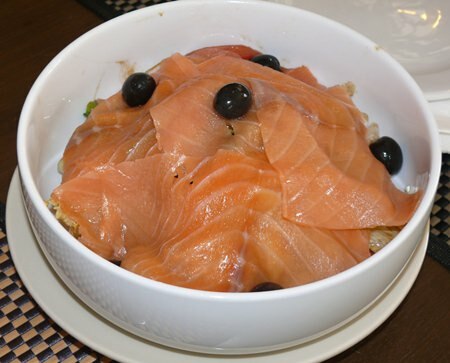 310), and were happy that we had decided to share, as it came in a large bowl, with fresh salad tossed in a vinaigrette and covered with salmon. This was an excellent starter. Our choices of mains were a fried seafood and tempura vegetables (B. 390) for Madame whilst I went for an old favorite of mine, being a Scaloppine al Limone (B. 300), a dish that is very piquant when sauced correctly. 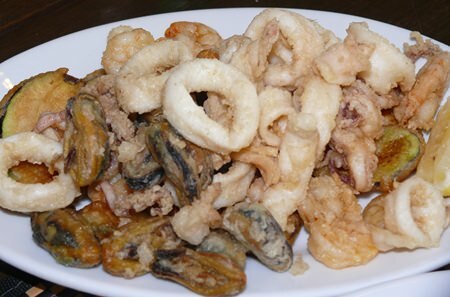 Madame was very well pleased with her fried seafood and vegetable combination, remarking on how the squid rings were not tough and rubbery and the tempura vegetables were also not overcooked. For me, the lemon sauce for the scaloppini was exactly right, smooth and slightly tart. I used some of the pizza bread to mop up the last of it. Pan Pan 2 is very handy for those who have traveled out to Mimosa, or coming from Ban Ampur, for example. Pan Pan 2 also does a home delivery service within a radius of six km from the restaurant. Orders over B. 600 have no delivery charge, but under B. 600, there is a surcharge of B. 60. We both considered the food to be fine examples of Italian cuisine and have no doubts about this restaurant. By the way, we went at lunchtime, and it is a very pleasant venue during the day as well as evenings. Pan Pan 2, Km 157 Sukhumvit Road (opposite Ocean Portofino), tel 038 237 880 – 1, spacious car park, restaurant open seven days, 10.30 a.m. close 10.30 p.m.